Does Equatorial Guinean passport holder require a visa for getting in Vietnam ? Equatorial Guinea citizens are required visa to Vietnam. Since Vietnam has not had any embassies or consulates in Equatorial Guinea, Equatorial Guinea passport holders either applying Vietnam visa on arrival (Vietnam evisa) with Vietnam Immigration Department on this website OR have to find Vietnam embassies in a nearby country for Vietnam visas. How to get Vietnam visa in Equatorial Guinea? Since there is no Vietnam Embassy / Consulate in Equatorial Guinea at the present, please check other countries to find the nearest Vietnam Embassy / Consulate to contact. 2. Apply online to request visa approval letter for picking up visa on arrival. Vietnam Immigration Department has another function of issuing Vietnam visa on arrival since 2003. 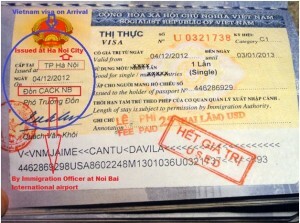 It is the second organization in Vietnam that authorizes to issue Vietnam visas beside Vietnam embassies. Vietnam visa on arrival are also available for applying by smart phone.